Sarcina is a Gram-positive organism which occurs in the soil and air, and has also been isolated from the human feces. , The pathogenicity of Sarcina is not well-established; however there are a few case reports which have documented its association with various gastric disorders. ,,, We report a case of a 55-year-old female who presented with features of gastric outlet obstruction. Endoscopy revealed an excavated ulcer in the pyloric region. The aspiration and biopsy from the ulcerated area showed features of adenocarcinoma along with the presence of Sarcina. The association of Sarcina with gastric outlet obstruction is known, and the finding of Sarcina organisms should prompt further investigation for causes of gastric outlet obstruction like an underlying malignancy. We document this case to highlight the diagnosis of Sarcina on fine-needle aspiration from the stomach and its rare association with a coexisting adenocarcinoma. 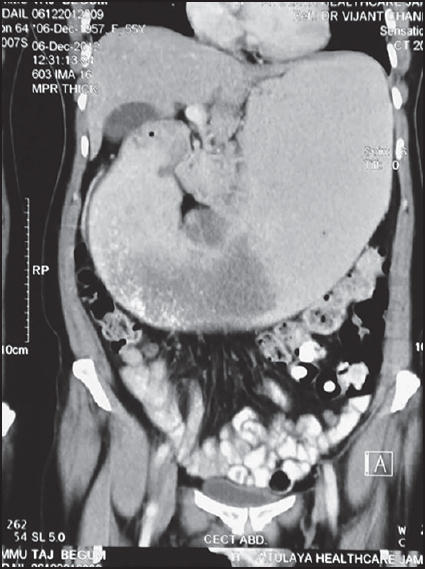 A 55-year-old woman presented with vomiting and pain in the abdomen for 3 months. CT scan of abdomen revealed a diffuse circumferential thickening involving the distal pyloric antrum of the stomach with a few superficial ulcerative areas [Figure 1] along with multiple hypodense enhancing hepatic lesions. On upper gastrointestinal endoscopy, a deep 3 cm × 3 cm excavating ulcer with elevated margins was seen in the pyloric canal. An endoscopic fine-needle aspiration from the ulcerated area was done, and multiple biopsies were taken. The aspiration smears were paucicellular and showed few scattered atypical cells along with organisms present in tetrads and octads conforming to the morphology of Sarcina [Figure 2]a and b. The biopsy showed ulceration of the surface lining epithelium, with the presence of many tumor cell clusters in the lamina propria. These cells showed moderate pleomorphism with vesicular nuclei, prominent nucleoli, and moderate amount of cytoplasm. The biopsy also demonstrated Sarcina, primarily on the luminal mucosal surface epithelium [Figure 2]c and d.
Sarcina occurs ubiquitously in the soil and has also been isolated from human feces. The pathogenic significance of this organism has been questioned previously, as some observers have suggested the stomach as their natural habitat. Although many cases have been associated with this organism in the veterinary literature, only a few human diseases have been documented which include cases of gastric ulcer, emphysematous gastritis and peritonitis due to gastric perforation. , All of these previously reported cases showed underlying gastric outlet obstruction and ulcer formation. Although Sarcina has been associated with cases of gastric outlet obstruction, it has been suggested that Sarcina infection may not be directly responsible for outlet obstruction and rather it may be an incidental association. Although its pathogenicity is still not clear, it has been suggested that the presence of these organisms may be considered as a marker of delayed gastric emptying and its accompanying complications. It is reasonable to believe that a search for an underlying etiology such as an occult malignancy should be considered, as was present in the present case. The scarcity of published literature on this organism may suggest that there was a decline in human cases since its initial detection, followed by a recent resurgence. The main differential diagnosis on light microscopy is with Micrococcus species. Both these organisms are Gram-positive and occur in tetrads or packets. Micrococcus is considerably smaller than Sarcina measuring only 0.5 µ, and also Micrococcus tends to form clusters, which has not been described for Sarcina. Sarcina has been identified in the gastric contents of humans in the year 1842, but its association with disease has been highlighted recently. There are recent case reports which suggest an association of Sarcina with cases of gastric outlet obstruction. 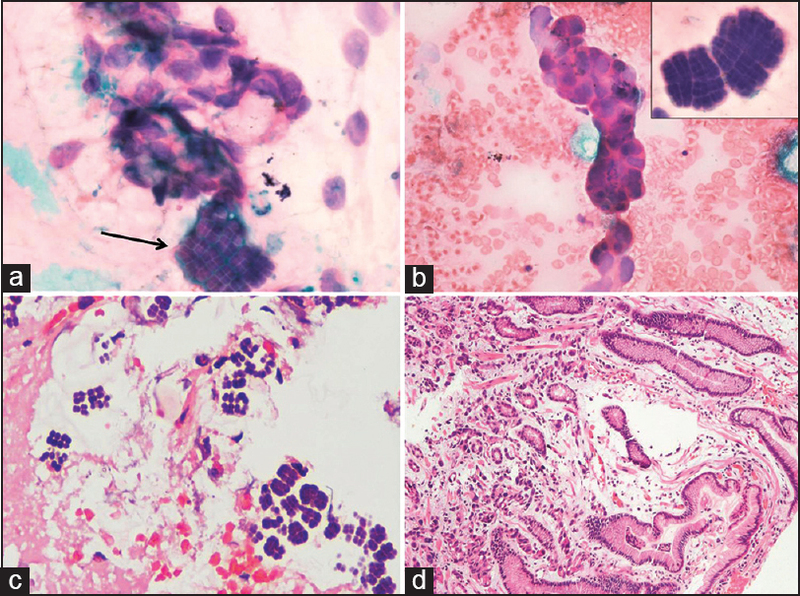 The present case demonstrates this organism in fine needle aspirate and biopsy of a gastric ulcer of a patient who presented with features of gastric outlet obstruction. This is the first case report which has documented the presence of Sarcina on fine-needle aspiration. In view of the concurrent adenocarcinoma with Sarcina infection in this case, it is recommended that presence of Sarcina in the gastric contents or fine-needle aspiration should prompt investigations for functional causes of gastric outlet obstruction like an underlying malignancy. Crowther JS. Distribution of anaerobic Sarcinae in human faeces. J Med Microbiol 1970;3:Pix. Smith J. The Biology of the fermenting Sarcinae. J Pathol Bacteriol 1933;36:155-468. Laass MW, Pargac N, Fischer R, Bernhardt H, Knoke M, Henker J. Emphysematous gastritis caused by Sarcina ventriculi. Gastrointest Endosc 2010;72:1101-3. Tolentino LF, Kallichanda N, Javier B, Yoshimori R, French SW. A case report of gastric perforation and peritonitis associated with opportunistic infection by Sarcina ventriculi. Lab Med 2003;34:535-7. Lam-Himlin D, Tsiatis AC, Montgomery E, Pai RK, Brown JA, Razavi M, et al. Sarcina organisms in the gastrointestinal tract: A clinicopathologic and molecular study. Am J Surg Pathol 2011;35:1700-5. Louis GB, Singh P, Vaiphei K. Sarcina infection. BMJ Case Rep 2014. pii: bcr2013201185. doi: 10.1136/bcr-2013-201185. Goodsir J. History of a case in which a fluid periodically ejected from the stomach contained vegetale organisms of an undescribed from. Edinb Med Surg J 1842;57:430-43. Beijerinck MW. An experiment with Sarcina ventriculi. Proc Sec Sci K Ned Akad Wet 1911;13:1234-40. Lowe SE, Pankratz HS, Zeikus JG. Influence of pH extremes on sporulation and ultrastructure of Sarcina ventriculi. J Bacteriol 1989;171:3775-81. Canale-Parola E, Wolfe RS. Studies on Sarcina ventriculi. I. Stock culture method. J Bacteriol 1960;79:857-9. Hubálek Z. Numerical taxonomy of genera Micrococcu Cohn and Sarcina Goodsir. J Gen Microbiol 1969;57:349-63.